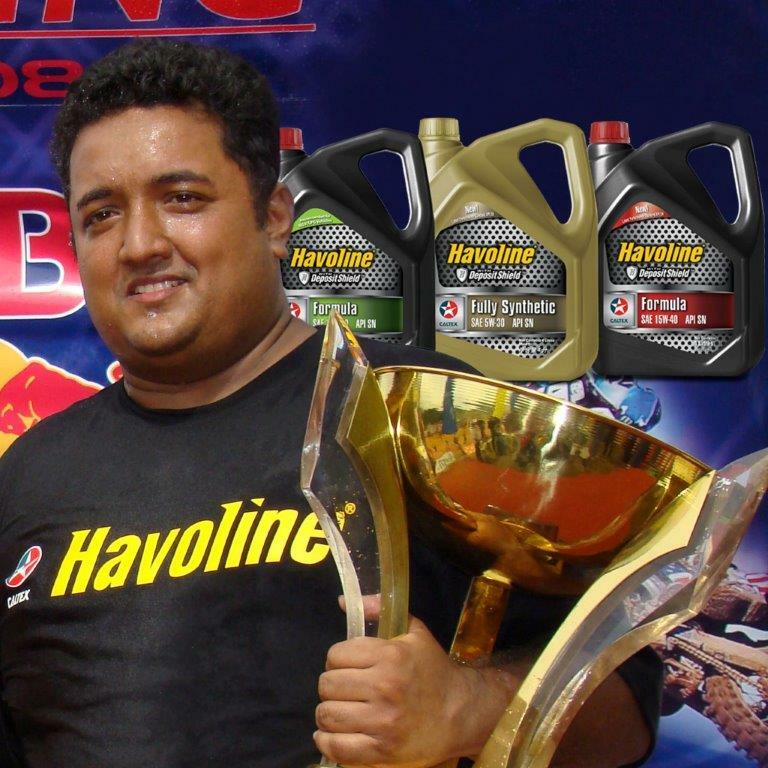 Havoline Brand Ambassador Clinches “Best Driver” Title at Gunner Super Cross | Welcome to Chevron Lubricant Lanka PLC. Havoline Brand Ambassador and Championship racing veteran Aravinda Premadasa clinched the ‘Best Driver’ title at the 8th Gunner Super Cross racing event which was recently held in association with the Sri Lanka Autosports Drivers Association (SLADA) in Minneriya. The most looked forward to 3500cc event, which is also considered as the fastest event for cars had several former champions contesting for the category main title. Aravinda clinched the ‘Best Driver Trophy’ at the event for the second consecutive year after defending the same title in 2012 as well. “Aravinda’s remarkable track record makes him a formidable opponent in Championship racing. He has been the brand ambassador for Havoline since 2003. This winning collaboration showcases the trusted quality and reliability of our high-performance brands” commented Mr.Kishu Gomes, Managing Director/CEO of Chevron Lubricants Lanka PLC. Havoline is Chevron’s world renowned lubricant brand for petrol engines. Aravinda has been associated with Caltex since 1997 being a pioneer member of ‘Team Caltex’ that participated in the Kandy Road Race, the Eliyakanda Hill Climb and the Pannala Gravel Race that year, and has won several main titles in SLGT 3500cc events, including the main Sri Lanka Association of Racing Drivers and Riders (SLARDAR) Champion trophy. “Havoline has been with me at the frontline of Championship racing for nearly two decades, which has also been the epitome of my racing career. My trust in Havoline to give me the best performance during a race gives me the confidence I need to challenge my limits and deliver a winning performance” commented racing pro Aravinda Premadasa. With over 23 years of experience in the field of motor racing both in Sri Lanka and overseas, Aravinda has accumulated innumerable wins in gravel, tarmac, circuit and hill climb events. His remarkable track record of wins for Foxhill Super Cross, Radella Hill Climb, Magastota Hill Climb and the Tissamaharama Track events makes him a formidable opponent in championship racing. He has also retained the Gajaba Supercross Championship trophy for 7 consecutive years (2001-2007), and won the prestigious SLARDAR Championship for 3 consecutive years (2003-2005). He has also been recognized as the only competitor to win the Super Fox, Gajaba Trophy and the SLARDAR Championship consecutively on more than one occasion. He was the winner of the President’s Trophy 2006 at the Tissa Auto Drome. He was also the winner of the Foxhill Super Fox in 1997, 1999, 2001, thereafter from 2004 to 2010 consecutively. Becoming the Champion Driver for the Gajaba Super Cross in 2012 was his most recent win. Over his racing tenure, Aravinda has also displayed his skill on international tracks in both go-kart and formula events in Singapore, Dubai, London, India and Sweden.